Ever since Oregon State University’s earliest days, we have been dedicated to providing an excellent education for our students. Being Oregon’s land grant university means keeping a tradition of service – and our faculty and students embody that tradition. Our faculty make themselves accessible to our students, and our students are dedicated to making the world a better place. OSU undergraduates can involve themselves in research with top-ranking faculty and utilize facilities that few universities in the world can offer, including the university’s own research forests, an ocean-going ship, the nation’s most sophisticated tsunami wave basin, a marine science laboratory at the coast, a nuclear reactor, test fields for experimental crops, a wine institute and beer brewing facility, and the Linus Pauling Institute for the study of nutrition and health. Here are just a few ways our diverse students are taking advantage of opportunities they can take into the world beyond Oregon State. Chemical engineering professor Christine Kelly is more than just a mentor in the lab, where she likes to make sure that her undergraduates are contributing real data to research. For Kelly, it’s important to be a support system for her students. “”It’s great to be able to come and hang out on Christine’s couch after a tough day,” says Kelsey Childress, a University Honors College student whose experience in Kelly’s lab has made her think about going to graduate school. California sophomore Sam Kelly-Quattrocchi was hooked on Oregon State after his campus visit. Not only was the campus beautiful, the University Honors College student got ample attention from an Oregon State adviser. “People here took a genuine interest in me,” he says. “It was something that other schools didn’t do.” Kelly also recognized the great marine biology program at Oregon State, as well as the Hatfield Marine Science Center, which provides research and internship opportunities for undergraduates. Oregon State is one of 12 universities around the country selected by the Howard Hughes Medical Institute to create an undergraduate genomics lab for freshmen and sophomore students that specifically researches and catalogues phage DNA. This three-year genome research project provides undergraduates with the opportunity to do research that is published and could be used by other researchers to develop treatments for tuberculosis. “This is one of the first national projects to change the way undergraduates experience biology labs,” says co-instructor Barbara Taylor, a zoology professor. Students in natural resources instructor Matt Shinderman’s classes have contributed directly to restoration work on a tributary of Central Oregon’s Metolius River. Shinderman and co-instructors Matt Orr and Karen Allen and their students surveyed aquatic insects, or macro-invertebrates, to determine how the ecosystem was responding to the tributary’s being restored – via backhoe and dump truck – to its original shape. 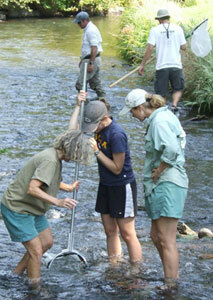 The group collected insects and took them back to the lab to get a sense of how the insects were faring. The results of their study provided a model that agencies can use for restoration work throughout the region. 2009 civil engineering graduate Erika McQuillen felt prepared to enter the workforce from her Oregon State coursework alone. But what really gave her an edge was getting out of the classroom. 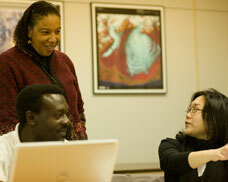 “OSU encouraged us to get internships and real work experience,” she says. And McQuillen did. 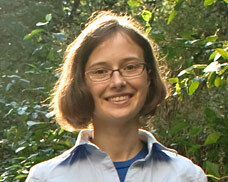 She had internships with Hoffman Construction in Portland, Ore., a company dedicated to sustainable building techniques. Now, McQuillen works for Hoffman full-time. Imagine a dry, ancient place that is known mostly for its modern-day political strife and bloodshed. Imagine several sources of water — all precious and needed — that ignore political boundaries. Then imagine going there to learn how people manage these issues in their day-to-day lives. That’s what a group of 19 Oregon State University students did last year. They traveled through Israel and Palestine under the guidance of renowned water conflict expert and Oregon State professor Aaron Wolf. They studied the geography and geology of the Middle East’s water supply and sources, as well as how those factors affect cities, agriculture and, ultimately, politics. “It felt natural to take the students there to look at these separate issues, and then look at them together,” says Wolf. Posted in Energy and Sustainability, Engineering, Environment and Natural Resources, Marine Science and the Coast, OSU People and Programs, Science, Social Science. When OSU’s William Chadwick and Robert Dziak traveled to the Mariana Islands northwest of Guam in 2004, they observed something no one had seen before — a live, deep-ocean volcanic eruption from a remotely operated vehicle, or ROV. They repeated the feat in 2006, gathering video footage of such high quality that their expedition drew national attention. Now, Chadwick (a volcanologist and chief scientist on the project), Dziak (an oceanographer) and an international team of scientists will return to the volcano in a project funded by the National Science Foundation to further study undersea eruptions. Called Northwest Rota-1, the volcano is still showing signs of activity, according to data retrieved from an underwater hydrophone. The scientists’ goal in this expedition is to put more science behind their observations. Northwest Rota-1 remains the only undersea volcano scientists have witnessed erupting, making it a unique site for research. Chadwick and his team will report their findings on a blog so that science students and classes from middle school through college — as well as the general public — can follow their progress. Follow the expedition on the Northwest Rota 2009 blog. Read about the group’s 2006 trip to Northwest Rota. 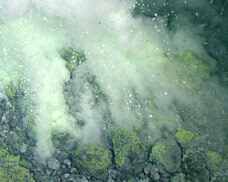 Watch more videos of undersea eruptions on YouTube. This November, Logan Mitchell will spend two months working at the Western Antarctic Ice Sheet (WAIS) Divide research station in Antarctica, along with 45 other scientist, students and technicians from across the United States. The NSF-funded project aims to collect a 3.5 kilometer-long ice core over three summer seasons, with the intention of providing Antarctic records of environmental change for the last 100,000 years. Portions of that core will ultimately end up in Ed Brook’s lab at OSU. 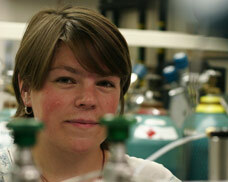 Mitchell, whose funding also comes from the NSF, faces a lengthy journey. He must first get to Christchurch, New Zealand, where he will board a military plane bound for McMurdo Station — a miniature polar city capable of housing 1,200 people — on the Antarctic coast. There, he’ll undergo a week of survival training for conditions that, even in the Antarctic summer, where temperatures average -10 degrees Celsius (14 degrees Fahrenheit). He’ll learn simple mountaineering and how to deal with a crevasse, a crack in the ice that can swallow a person. And then he’ll head 1,000 miles northwest to the WAIS station. Because it is so remote, Mitchell underwent the most extensive physical evaluation he’d ever experienced. 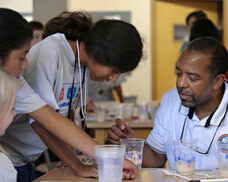 As a precaution, people visiting the WAIS must have their wisdom teeth removed. The knee-length parka Mitchell will wear is bright red; if he’s injured, it’ll make him easy to spot on the flat, white landscape. Although he’ll have limited access by satellite to the Internet at the WAIS outpost, Mitchell is planning on filling in the OSU community on his day-to-day life, from his work as a core handler to the things, like the “ice Olympics,” polar researchers do for fun. Studying ice cores gives Ed Brook and Logan Mitchell a picture of climate change. Siple Coast of Antarctica, to name a few — are fruitful grounds for research. They hold the keys to understanding the history of the Earth’s climate, as well as its future. Brook and Mitchell study the tiny air bubbles that are trapped in ancient polar ice. Measuring greenhouse gases — methane and carbon dioxide — in those bubbles helps them reconstruct climate changes throughout the past 800,000 years. “Ice cores are unique,” says Mitchell. “The bubbles in the ice core are the actual atmosphere from that time. It’s not a proxy. We’re studying the real deal.” Brook’s lab is one of the few throughout the world that can work with a high quantity of ice core samples, enabling his team to continually draw more refined pictures of past climate changes. Not only that, Brook encourages students like Mitchell to take advantage of as many opportunities to engage in their field as possible. Brook wants his students to branch out, to go to meetings and contact researchers at other universities, which is essential in an interdisciplinary field like ice-core research. Brook and Mitchell need to know, for example, how droughts and fires are related to greenhouse gases on a global scale. They need to understand hydrology and glaciology to help put their research into context. Mitchell’s focus on ice-core research emerged from a longstanding love of the outdoors, hiking and colder environments. When he started thinking of the places he visited with a scientific perspective, he realized he had the potential to work in a relevant and valuable field. 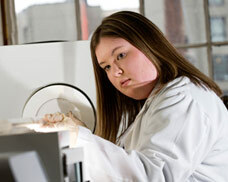 Brook was available when Mitchell needed advice about applying to OSU and choosing a lab, and the work piqued Mitchell’s interest. Posted in Environment and Natural Resources, Science. 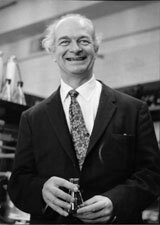 When Linus Pauling enrolled at Oregon Agricultural College — Oregon State University’s predecessor — in 1917 to study chemical engineering, he was taking the first steps on a path that would lead him to Stockholm, Sweden, in 1954 to accept the Nobel Prize in Chemistry. By the time Pauling died in 1994, he was not only the first person ever to win a second individual Nobel, but one of the most decorated and respected scientists of the 20th century. The U.S. Postal Service recently recognized Pauling’s lifetime of achievements with a new set of “American Scientists” stamps honoring Pauling, biochemist Gerti Cory, astronomer Edwin Hubble and physicist John Bardeen. To celebrate the stamp’s official March 6 release, OSU hosted an unveiling in the Memorial Union Ballroom featuring Linus Pauling Jr. and Corvallis Postmaster John Herrington, who stamped envelopes with a commemorative postmark (PDF) designed specially for the occasion. More than 300 people attended the event, and the city of Corvallis sold out of American Scientist stamps by the end of the event. “The way that Linus Pauling has taken off here at OSU is extremely rewarding, and OSU has my eternal thanks,” said Pauling Jr.
Pauling was known for working successfully in different disciplines throughout his life — physics, chemistry and biomedical research, to name a few. His stamp honors one of his most significant discoveries in molecular biology — a field he pioneered. Pauling’s studies of hemoglobin led to his 1948 discovery of the molecular nature of sickle cell anemia. “That discovery made him look into the scientific, social and political aspects of that kind of work,” says Cliff Mead, head of Special Collections for the OSU Valley Library. It was because of Pauling’s discovery, Mead says, that sickle cell anemia became treatable. Though Pauling earned his bachelor’s degree in 1922 and spent the rest of his academic and professional life at California universities and research centers, his fondness for OSU never waned. In 1986, he donated his papers to OSU; the collection numbers more than 500,000 items, and it includes material on Pauling’s research into human blood and sickle cell anemia. 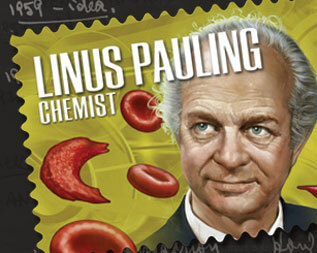 Two years after his death, the Linus Pauling Institute, which he helped to create, was moved from California to OSU, where it continues Pauling’s scientific legacy through internationally acclaimed research on vitamins and essential minerals. The institute was named a center of excellence for complementary and alternative medicine by the National Institutes of Health in 2003 — a status renewed recently with a $6-million grant from the NIH. Pauling’s legacy lives on in many other ways at OSU as well, from the annual Ava Helen and Linus Pauling Memorial Lecture for World Peace to the Linus Pauling Chair in Chemical Engineering, held now by Dr. Philip Harding. Posted in Health, OSU People and Programs, Science. Dawn Wright is known as "Deepsea Dawn"
Dawn Wright, an Oregon State University professor of geosciences, has been named Oregon Professor of the Year by the Council for the Advancement and Support of Education and the Carnegie Foundation for the Advancement of Teaching. An OSU faculty member since 1995, Wright is a marine and coastal geography expert so passionate about her subject area that she’s known as “Deepsea Dawn.” Her popular web site with links to many interactive features can be found at http://dusk.geo.orst.edu. She has a joint appointment in OSU’s College of Oceanic and Atmospheric Sciences. Undergraduate students are often mesmerized by tales of her first-hand experiences from 25 scientific voyages across the planet, including descents to the deep-sea floor in manned submersibles and explorations of endangered tropical coral reefs. Discussions about topics closer to home include efforts to map Oregon’s near-shore geology and continental shelf, with applications many students and others can relate to — tsunami preparedness, fisheries management, coastal erosion and wave-generated electricity. Editor’s note: The following profile on Professor Wright is excerpted from the Spring 2007 issue of Terra, the OSU research magazine. Pressing her face against the jetliner window, Dawn Wright scanned the azure expanse of the shimmering ocean for a glimpse of her destination: a tiny volcanic archipelago that is barely a blip in the vast South Pacific. Located 5,000 miles from Wright’s office at Oregon State University, American Samoa is closer to New Zealand than to Hawaii. It was 2001, and the OSU geosciences professor was on her way to the outer reaches of Oceania to study the most remote of the U.S.’s 13 national marine sanctuaries, Fagatele Bay. Using state-of-the-art sonar equipment mounted on a small survey boat, she and a team of oceanographers from the University of South Florida “pinged” clusters of sound beams into the bay’s crystalline waters. These acoustic readings produced the sanctuary’s first precise seafloor map. The mapping, though, was just one facet of the mission. As an international innovator in marine GIS — geographic information systems — Wright was laying the groundwork for a sweeping storehouse of data about Samoa’s sanctuary. Science and policy-making are stymied, Wright points out, when data are skimpy and scattered, as they are on this distant shore. And the dearth of data is not unique to Fagatele Bay. Wright’s bigger vision is of a new era in global ocean data management built on the “seamless merging” of data into a Web-based clearinghouse. Drawing from oceanography, geography and geology, from the disparate agencies and jurisdictions that compile oceanic data, the clearinghouse would give scientists, resource managers, fishermen and conservationists fingertip access to simulated ocean systems from anywhere on earth. It is not an easy vision to implement, but Wright is undaunted. At age 8, transfixed by the televised moon walk, young Dawn briefly mulled a space career. But another TV experience tipped the scales toward ocean science: “The Undersea World of Jacques Cousteau.” “I was riveted,” she says. Today, with reefs dying and fisheries collapsing across the globe, a profound sense of urgency propels Wright’s energies. Accurate predictions — and sound policy — about the “great blue engine” that powers the planet depend, she says, on getting the data right. Posted in OSU People and Programs, Science.